It might seem odd to suggest getting back to nature in a big city like Newcastle, but it’s not so strange when you consider that it’s just a stone’s throw from the coast. So, it’s actually the perfect destination if you fancy combining culture and seaside fun on your next family holiday. It’s the seaside aspect we’ll be talking about today, especially as the local coastline is not only dotted with lovely little seaside towns, but also Blue Flag beaches, traditional fish and chip shops and plenty of family-friendly attractions. Here are some of our favourite things to do when popping to the coast for a day, while you can find out more about local attractions and where to stay at NewcastleGateshead. The local coastline is home to some fantastic lighthouses that are great fun for families to visit. Souter Lighthouse, with its classic red and white striped design, is definitely among the best, not least because it was actually the first lighthouse in the world to be designed and built for electric power. Having opened in 1871, it is no longer operational, but it’s still one of the coastline’s icons. Alternatively (or as well! ), you could head to St Mary’s Lighthouse and Island, which you’ll find at Whitley Bay. This lighthouse guided ships to shore for just under a century, finally closing in 1984. Today, one of its main attractions for visitors is the fact that you can climb all the way to the top – and trust us, doing so will give you some outstanding views of the coast. You just need to be prepared to tackle 137 steps! What we also like about coming here is that there’s plenty else to enjoy alongside the lighthouse. You see, it’s surrounded by a nature reserve, which the kids are bound to love exploring – there are rock pools, a beach, wetland habitats and more. There’s also a little shop where you can pick up toys and souvenirs for the children to take home. While you might assume that the coastline’s only really a good place to visit when the sun is out, that’s actually not the case. When the wind’s howling, for instance, the beaches can be dramatic settings for walks (we’ll talk more about beaches in a moment), while there are plenty of indoor attractions too. Among the best is the Blue Reef Aquarium, which is on Tynemouth’s Grand Parade. Come here and you can see everything from cute harbour seals to even monkeys – not being a marine creature, the latter is bound to be a particular surprise! Daring kids will love seeing species like black tip reef sharks, while the rockpool encounters will give them the chance to get up close to weird and wonderful creatures. The great thing about the coastline near Newcastle is that it’s home to lots of Blue Flag beaches. Stretches of sand with this award are known for being clean and safe, which makes them perfect for families. Tynemouth Longsands is one of the beaches with Blue Flag status, and it has everything from pretty dunes and cliffs to a charming cafe right on the beach. King Edward’s Bay, meanwhile, is a lovely little beach that’s actually located below the fantastic Tynemouth Priory and Castle. Combining trips to both is a great basis for a day out, especially when the sun is shining! Portugal remains one of the world’s hottest vacation destinations, with perhaps the most prestigious of them all in this beautiful country being the Algarve. Boasting beautiful beaches, fantastic temperatures, relaxing resorts and picturesque towns and ocean-front vistas, Algarve is a traveler’s one-stop shop for partying and paradise. There’s more to do in Algarve than simply laze around on one of its several golden-sanded beaches, however. If you’re planning on hitting up Algarve for your next holiday and are looking for things to do, then here are the places to go. Lagos is the place to be if you seek a thriving nightlife with fine cuisine and interesting locals. As many people say, Lagos is the “carnival queen” of the Algarve region and has something to offer anyone from its characteristic cobbled streets. This quaint town is for those who are seeking a bit of a quieter holiday that has less of a partying atmosphere. Featuring fine views of a steep and wooded countryside, Monchique is a top choice for travelers who seek relaxation and who want to avoid the hustle and bustle of towns like Lagos. This ancient city that’s set along a peaceful river is another hot destination for anyone who’s seeking a relaxing and laid-back vacation. This area is perhaps amongst the oldest in all of Portugal, with its history dating all the back to the Roman times. If you’re going for the “real” Portuguese experience, then Faro is the place to go. Featured in the area is a medieval quarter that treats visitors to a taste of what ancient Portugal was like several centuries ago. Should water sports and surfing be your thing, then Sagres or Carrapateira are definitely the places to go. Located out on the west coast of Portugal, these fun-loving towns are charming and filled with laid-back locals who are sure to show you a good time. You can read the reviews and ratings of the Algarve golf courses here. If you’re interested in going to Algarve solely for the golf, then we live in a world of specialist golf holidaymakers, like Golf Kings – so have a look at the site if your idea of a holiday to Algarve is just golf, golf and more golf. Algarve is stunning and is more than deserving of the attention it has had in recent years. Whatever you do once you’re there, I’m sure you’ll have a wonderful time. Happy travels. The Alps are one of Europe’s most beautiful locations to visit and also one of its most popular. Tourism began in the early 19th Century and large scale tourism industry started in the 20th century with large hotels being made. Over the past 30 years or so all tourist facilities have been modernized and a large number of tourists are attracted throughout the year. 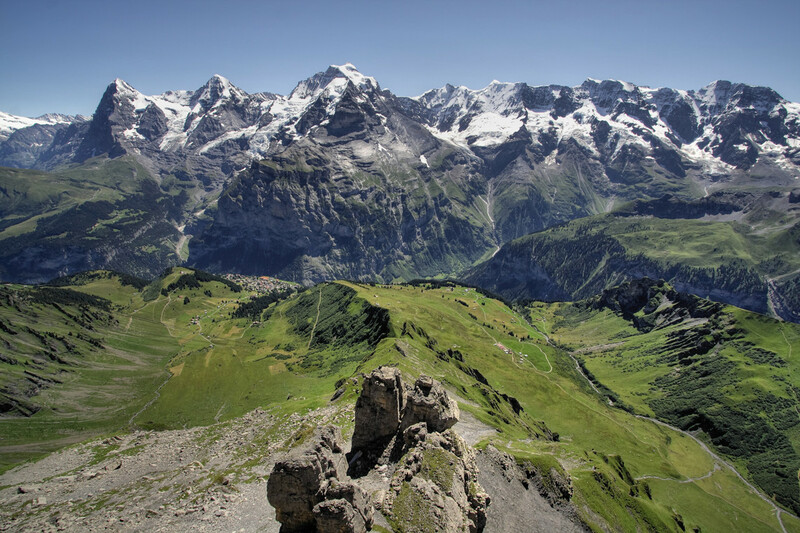 Switzerland boasts about its cultural and geographical diversity but what stands out the most are its mountain ranges. They attract a number of different types of tourists be it those who come for just the scenic views or for cycling, skiing, lakes, food or just some place to relax and spend time with their family. With the fresh mountain air carrying the scent of flowers growing in the meadows with mountain peaks surrounding you from every side Switzerland feels like a magical place in its own right. Even just going for a walk is a magnificent experience in such a place. You don’t need to be a hiker to go see what Switzerland has up to offer because all types of people, even someone with an average physique can be catered to amongst the vast array of choices. Be it a cycling enthusiast or someone wanting a look at the great outdoors Switzerland offers the best mountain holidays experience. Grindelwald is a mountain village with cafes restaurants and a good number of shops. It is a fantastic place for country walking and enjoying the scenic beauty present there. You can also get a chance to travel on one of the world’s most famous railway journeys to Europe’s highest railway station at 3454 meters. The railway will take you through tunnels and past glaciers which is truly a journey to remember. Holidaying in Grindelwald also leadsup to other scenic resorts including the lakes of Thun and Brienz. Davos is one of Switzerland’s top walking destinations and has 700km of marked walking trails. Guests even receive free use of some cable cars so the majestic beauty can be enjoyed by all. There is abundant wildlife and beautiful traditional Swiss villages to be enjoyed in your walks. There is abundance of paths for people to choose from. Tirano in Italy is just a train ride away to visit and the skiing resort of St.Moritz can also be reached easily. A cheese factory and a brewery are also present in Davos for those looking for a bit extra than just the walking. Switzerland is also famous for its world class ski resorts and attracts a lot of skiers from all over the globe. Resorts like Zermatt are considered one of the best in the world to go for skiing. Not only are Swiss resorts for professional skiers but teachers are also available who can teach you how to ski in English and Swiss resorts like Wengen have nursery as well as intermediary slopes for those who are not so familiar with skiing. Whether you are a fan of skiing, cycling, hiking or only plan on seeing the scenic beauty of the great outdoors, Switzerland is the ideal destination to spend your mountain holidays, giving you an experience that is next to no other. Switzerland has policies and institutions in place which make it very convenient for tourists to exchange currency. ‘Franc’ is the currency used in Switzerland you can check up to date currency rates online with the Travelex currency converter. The best places to exchange currency are Railway stations where they accept foreign currency notes as well as travel’s checks. ATMs can also be used to acquire your currency and most Swiss banks, shops and restaurants in the major cities accept international credit cards.